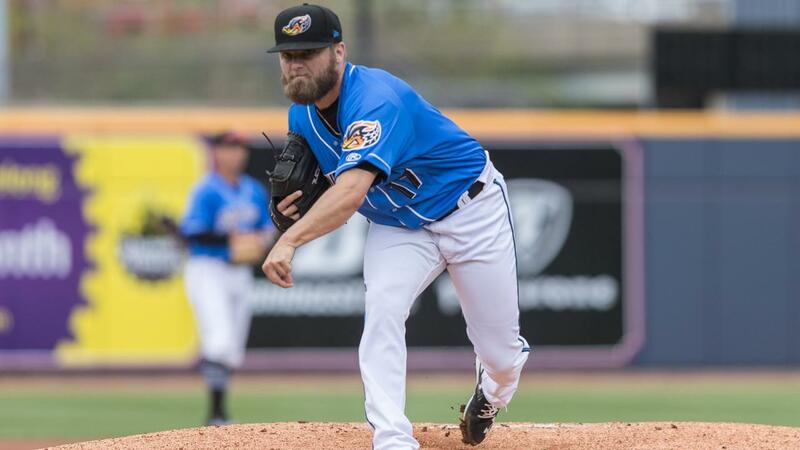 Akron RubberDucks starting pitcher Sean Brady threw seven scoreless innings while the offense broke loose behind Andrew Calica's three hits and two-run home run, to defeat the Altoona Curve 9-0 in Game 4 of the EL Western Division Series Saturday afternoon in Altoona, Pa., to advance to the 2018 Eastern League Championship Series. The RubberDucks (3-1) scored two runs in the top of the first after Ernie Clement and rehabbing Cleveland Indians infielder Josh Donaldson led off the frame with singles. Tyler Krieger followed with a run-scoring ground out and Calica came through with a clutch two-out RBI single to make it 2-0. Sean Brady (1-0) came through with a huge outing for the RubberDucks, throwing seven scoreless innings, allowing seven hits, while walking none and striking out three. Reliever James Karinchak threw a scoreless eighth inning, stranding a hit and striking out the side. The ninth inning was a scoreless inning by Kieran Lovegrove, who allowed a hit. After the Ducks scored two in the first on Krieger's groundout and Calica's two-out single, they added three runs on three hits in the third inning to make it 5-0. Krieger led off the third with a single. Following a Nellie Rodriguez strikeout, Calica launched his first homer of the playoffs off Altoona's Dario Agrazal, to give Akron a 4-0 lead. Later in the frame catcher Daniel Salters earned a bases-loaded walk to cap the inning's runs at 5-0 Akron. The seventh inning was when Akron put the game away, scoring four times on five hits. Three singles with one out loaded the bases. Curve reliever Sean Keselica's wild pitch scored Rodriguez, to make it 6-0. Following a Ka'ai Tom walk that reloaded the bases, Mark Mathias added an RBI single, followed by Salters' infield single that scored another run, extending the lead to 8-0. The scoring ended after Altoona reliever Geoff Hartlieb came on and issued a bases-loaded walk to Clement. Calica and Mathias each had three hits as part of Akron's 15-hit attack. Calica had three runs batted in and Salters knocked in a pair of runs. Salters and Jodd Carter each had a pair of hits. The Ducks won the best-of-five series, 3-1, and advance to face the New Hampshire Fisher Cats in the Eastern League Championship Series…Akron has defeated Altoona in all five ELDS matchups all-time, this the first time when Altoona held home-field advantage…Game 1 is at Canal Park on Tuesday at 6:35 p.m. and Game 2 is Wednesday at 6:35 p.m. at Canal Park. The series will shift to New Hampshire for Games 3-5…Indians 3B Josh Donaldson was 1-for-3 with a run scored in his third rehab appearance with the Ducks…Time of game: 2:53…Attendance: 2,898. The RubberDucks will face the New Hampshire Fisher Cats in the best-of-5 Eastern League Championship Series, which will start at Canal Park with Games 1 and 2 on Tuesday and Wednesday, respectively. Both games are scheduled for 6:35 p.m. and will have post-game fireworks, sponsored by Ultimate Sack. The game will be broadcast on Fox Sports 1350 AM, the WARF iHeart channel, and the TuneIn Radio App.